Display Supply Chain Consultants (DSCC) released a new free white paper (sponsored by Nanosys, a quantum-dot producer) in which it analyses the premium TV market and compares the future of OLED TV to that of QD-LCD TVs. According to DSCC, the total TV market will grow from 261 million units in 2016 to 282 million in 2021 - a slow CAGR of 1.6". The OLED TV market will grow at a rapid rate of 50% - from 0.9 million panels in 2016 to 6.8 million in 2021. Even at this fast growth rate, OLEDs will represent only 2.4% of the total TV market in 2021. The main constraints towards faster OLED TV growth, according to DSCC, will be production capacity and not demand. 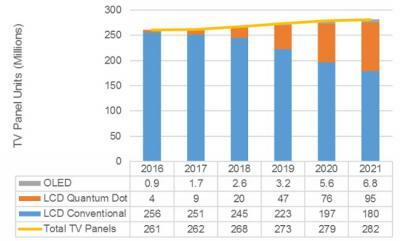 Quantum Dots LCDs will grow at an even faster rate - a CAGR of 88%, to reach 95 million units in 2021.